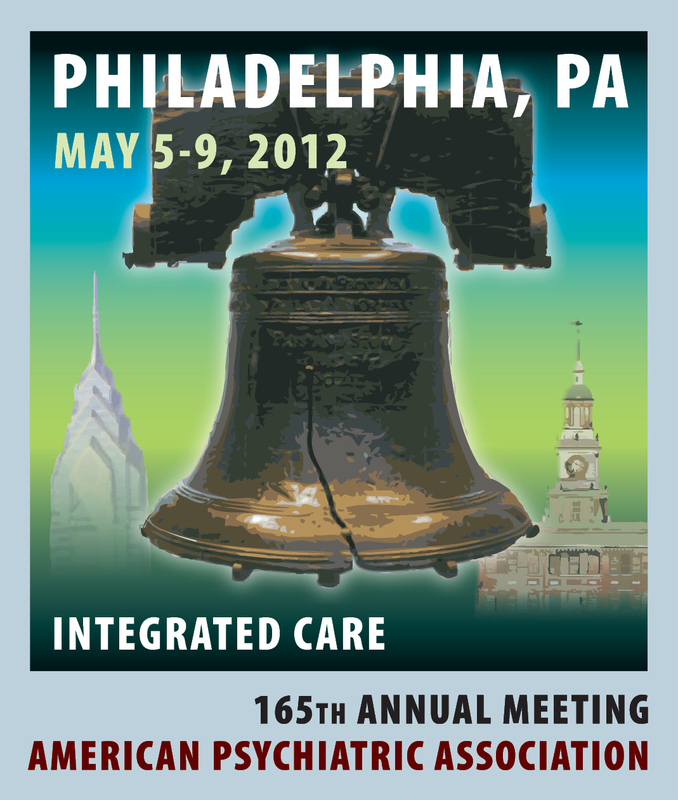 On May 6, 2012, the day after a historic protest at the annual convention of the APA in Philadelphia, following speeches by Robert Whitaker, Jim Gottstein, and Keris Myrick at the Church of St Luke and the Epiphany, about six psychiatric survivors present at this same mini-conference headed out to participate in the Radical Caucus of the American Psychiatric Association at the Courtyard by the Marriot Downtown. Two psychiatrists that I know about have posted about this Radical Caucus event, or rather non-event, already. I would like to clear up a little of the confusion that may have been sowed by their interpretations of the occasion. I was more dismayed than surprised by the announcement in the flyer of this event. I was put off right away by the qualifying part reading, “Although biomedical research is important…” That statement concedes more to the eugenic policies of medical model psychiatry than I think necessary. It was also a good indication of how radical these psychiatrists, despite the rhetoric, were not. Psychiatrist Bradley Lewis did an Op-Ed piece on the caucus for the Mad In America website entitled Reflections on the 2012 Radical Caucus Meeting. This year’s American Psychiatric Association (APA) convention was a charged affair owing to a number of factors, including the intense DSM V controversy, the recent high profile critiques of the profession (such as those by Robert Whitaker and Marcia Angell), the presence of documentary filmmakers shooting an expose on the APA’s role in an iatrogenic death from antipsychotics, and the new energy, participation, and strategies that Occupy Wall Street protesters brought to meetings. Out of all this, one of the most fascinating moments in the conference was when “APA Radical Caucus” invited psychiatric activists from Mindfreedom and the Icarus Project to their annual caucus meeting. Everyone didn’t show up, but we did show up. Part of the reason that the AACP members of the Radical Caucus were defensive is that they think they have been trying to live up to recovery concerns. There are two main problems with being too self-congratulatory here. The first is the way that recovery has been taken up is largely controlled by psychiatrists rather than consumers themselves. It is the psychiatrists, powerful budget administrators, and increasingly big pharma marketers who are having disproportionate influence on how consumers can participate and picking which consumers are appropriate. That means many activists are increasingly wary about the way that “recovery” is being adopted. Second, and more to the point of this meeting, the psychiatric activists at this meeting were not talking about recovery. They were talking about coercion and forced treatment. We were also talking about, and I don’t know how it could have escaped Dr. Lewis’s attention, the harm that comes of treatment, forced or otherwise. This harm is harm of which psychiatrists are the direct source. Some of us, all of us were not pursuing this line of questioning, felt that many of the psychiatrists attending the caucus were guilty of doing serious harm to many of the patients they saw in practice. The other entry was posted by British psychiatrist Duncan Double on his Critical Psychiatry blog, and bears the heading, Occupy APA. A particular issue currently is the DSM-5 revision. As I have mentioned previously, I have signed up for the campaign to abolish psychiatric diagnostic systems like DSM. I think it would help psychiatry to be without a diagnostic system for a while. It managed without one until 1948. The American psychiatric system has become very dependent on DSM for billing purposes, but I’m sure the insurance companies could develop an alternative system unrelated to DSM. After all, in the UK, clusters have been created for the introduction of payment by results without requiring an ICD diagnosis. On this score, at least, we would be in agreement. This need to ‘abolish psychiatric diagnostic systems’ was, in some measure, what the protests of the day before had been all about. One has to wonder though a little about his saying “for a while”. Does this indicate some subconscious reluctance on his and his associates part to carry through on the aims of their campaign? I think the caucus itself just showed how far removed we are from any real and meaningful dialogue with most psychiatrists on these issues. I’m not saying this dialogue won’t arrive, I’m just saying it’s a long way off as of yet. I wasn’t particularly impressed by most of the psychiatrists in attendance although one, who also leaves a comment under Bradley Lewis’s Op-Ed piece, Pittsburg psychiatrist Wesley Sowers, stands out for having had the decency to hold a conversation with a few of us psychiatric survivors following this meeting. The discussion was slated to continue afterwards at the Alma de Cuba. The Alma de Cuba struck me as more the kind of a restaurant a psychiatrist would chose over a psychiatric survivor because they can afford it. One psychiatric survivor called it, “gourmet”. This psychiatric survivor called it, “pricey”. It seemed the psychiatric survivors and psychiatrists were seated at separate tables for the most part, and so the ensuing discussion must have been rather limited. There will be other APA Conventions, other protests, and other caucus meetings in the years to come. Perhaps at some point in the future we will really be able to work together on aims we hold in common. Alas, if so, that point is still far far away. All of the psychiatrists who took part in the Radical Caucus were there to attend the convention of the American Psychiatric Association. 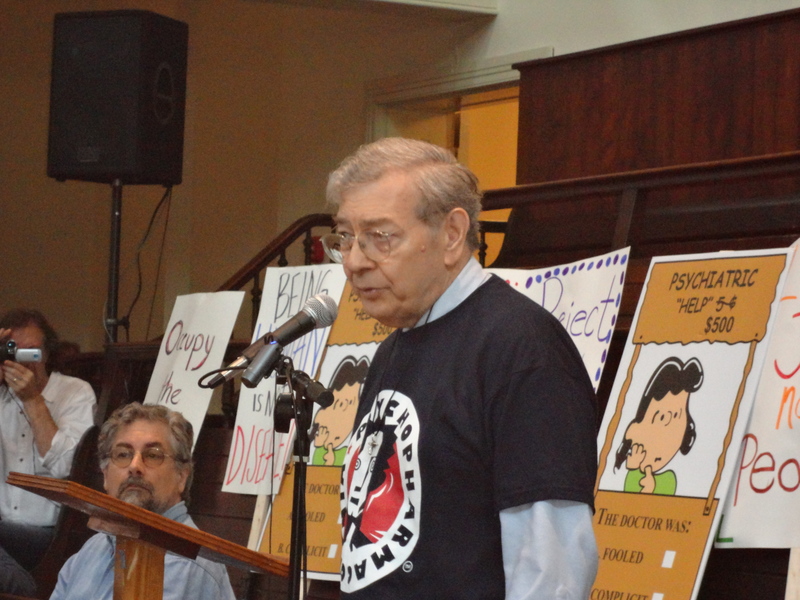 All of the psychiatric survivors, whether with MindFreedom, or the Icarus Project, or completely independent, were there as part of a protest directed against this same American Psychiatric Association, over the upcoming release of its label bible, the DSM-5, that took place on the previous day. We had among the planners of this protest, and marching alongside the demonstrators, a psychiatrist. This psychiatrist even had some of his patients taking part in the protest with him. His name is Dr. Clancy McKenzie. There is a world of a difference between a psychiatrist like Clancy who was willing and able to march with the demonstrators and those psychiatrists who found it convenient or opportune to attend the APA convention. It is unfortunate that he wasn’t around to attend this Radical Caucus the next day. If my hat goes off to anybody, then it goes off to Clancy McKenzie. He did something real, and that something real wasn’t kowtowing to the APA, publishers of the DSM. He sent me a private letter once (along with a book) that I will never forget…. The letter was very personal, and probably best kept private. Dr. McKenzie is a good and decent man, who cares deeply for others. And I’m not surprised in the least that he was marching outside the convention with our brothers and sisters.